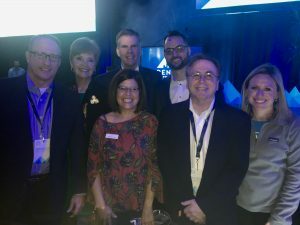 DENVER – At the kickoff breakfast for Denver Startup Week, JPMorgan Chase announced a total of $510,000 in philanthropic investments to four Colorado nonprofit organizations that support Denver’s underserved entrepreneurs and small business community. These investments are part of the firm’s global $150 million Small Business Forward program, which supports women, minority and veteran-owned small businesses to help build their long term success, creating local, inclusive economic growth. “We’re pleased to partner with Denver’s nonprofit community as we continue to support programs that expand access to opportunity and invest in more of Colorado’s underserved entrepreneurs,” said Chris Jensen, Managing Director and Region Manager for the Commercial Bank in Colorado for JPMorgan Chase. Chase has been a sponsor of Denver Startup Week since its inception in 2013 and has invested in Colorado’s startup and small business community for several years, helping businesses grow and create local jobs. The Commons on Champa, $75,000. The Commons, a charitable organization of the Downtown Denver Partnership, is a resource center supporting economic development, innovation, and entrepreneurship to keep Denver as one of the best places in the country to start and grow a business. The funding will support programs at The Commons to assist underserved entrepreneurs. JPMorgan Chase has invested $455,000 in programming offered at The Commons since 2013. Re:Vision, $150,000. The investment will support Re:Vision’s programming to train underserved food entrepreneurs with the ultimate goal of developing pathways out of poverty through business ownership and entrepreneurship. Over the past decade, Re:Vision has worked to advance one of Denver’s most vulnerable neighborhoods, Westwood. Mi Casa Resource Center, $150,000. Mi Casa educates, trains and supports youth and adults on their path to success in education, employment, and business ownership. The funding will support a program to assist underserved mobile food entrepreneurs in the Denver metro area. Colorado Enterprise Fund (CEF), $135,000. CEF is a Community Development Financial Institution (CDFI), and strives to accelerate community prosperity by financing and supporting entrepreneurs and small businesses. The investment will provide additional access to capital for underserved entrepreneurs through the organization’s Healthy Food Fund (HFF). The HFF provides flexible financing for healthy food businesses, including those in food production, processing, distribution and retail.